We’re all about drinking your greens and keeping things simple. But we’re also about sneakin’ the greens in those items you wouldn’t normally think of, like soups and sauces. 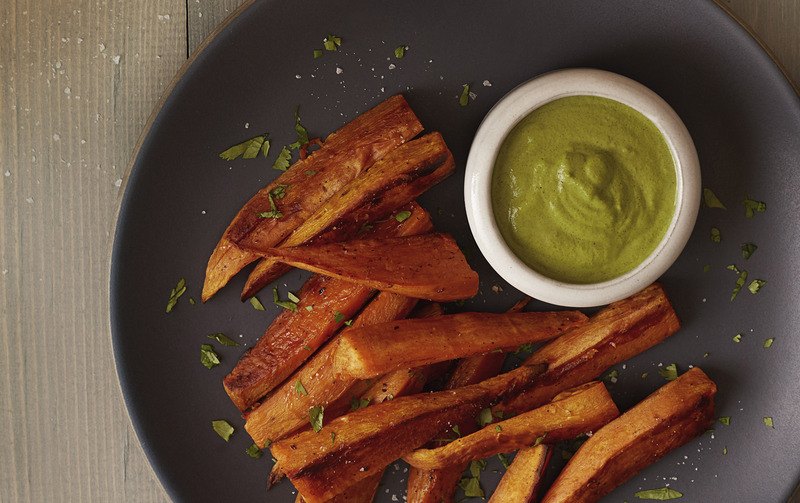 Today, we’re whippin’ up baked sweet potato fries with creamy macadamia-chimichurri sauce. And we spiked the sauce with our Raw Reserve, Original for a boost of probiotics and nutritious greens from land and sea. Talk about some smart snacking. Combine the macadamia nuts, Amazing Grass, water, vinegar, garlic, jalapeno, oregano and salt in a blender. Blend into a smooth cream. Add the parsley and cilantro and blend again. Transfer to a sealable jar and refrigerate for a minimum of 1 hour before serving. Trim and peel the sweet potatoes. Halve the potatoes width-wise, cut each half length-wise, then slice each section into 4 long wedges. On a large rimmed baking sheet, toss the wedges with the coconut oil and season generously with salt and pepper. Cover the pan tightly in aluminum foil and roast for 15 minutes. Discard the aluminum foil and continue to cook uncovered for about 10-15 minutes longer, turning the wedges over halfway through. Remove from oven when wedges are golden brown and crispy on the outside. Transfer the sweet potato fries to a serving plate and serve with a generous cup of sauce on the side for dipping.